The Olympus OMD system is incredibly versatile and feature packed making some aspects of landscape photography very easy. For the beginner it can seem daunting with the complicated menu system and range of customization options. And the manual is less than helpful. Being so feature rich means it allows the photographer many opportunities to capture images in different ways, which needs an understanding not only of the features, but which one is most suitable for the situation. 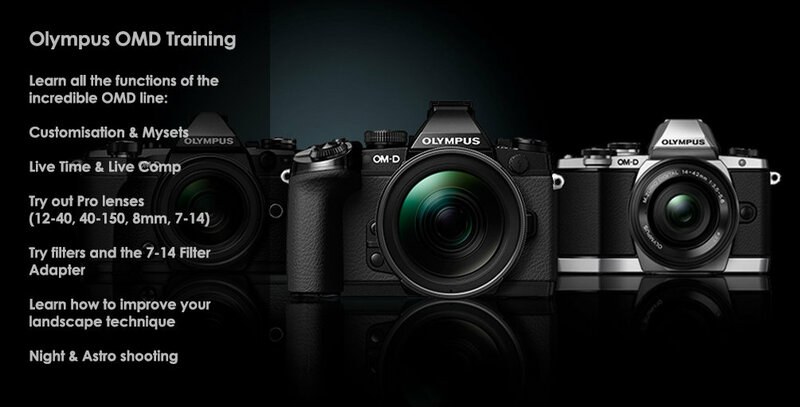 An Olympus Workshop will help you not only understand the features and benefits of your system, it will help you get better images. The same as other Workshops with inspiring locations to visit, we will also concentrate on setting your OMD up to suit you, explore the menus and features, and then practice all of the features to help understand what they do. We will discuss your way of shooting, the genres you have an interest in, and set the camera up for these to give you the flexibility and confidence you need. We will explore Mysets and Custom settings, setting button features, and explore the reasons behind doing it. Having used Olympus since 2014 and rebuilding this website with 90% of the images taken with OMD’s I know the system well and what it is capable of. During a Workshop we will explore the unique features so that you master your OMD, allowing you to be more creative, competent, and see your ‘keeper’ rate increase dramatically. Olympus Workshops are held in the same stunning locations as general workshops, please see main Workshop page. I cover the East and West coast, Peak District, Yorkshire, North Wales and Northumberland. Other areas can be arranged. All aspects of your OMD and how it can help your photographic creativity, from long exposures with Live Time, how to use Live Comp, & understanding how they differ from DSLR’s. The emphasis is advancing your landscape photography whilst at the same time mastering your OMD. Using filters for balancing exposure, preventing blown images and getting shots like a pro. We will also practice creative filter use such as ND filters for long exposure and polarisers for removing reflections and boosting colour. Filters will be provided for your use during the Workshop. We will cover all camera settings for landscape photography, ISO, Aperture, Depth Of Field, Exposure Comp, as well as the more advanced features found on OMD’s and how you can utilize them. We will also cover how you can set your OMD for different shooting situations. If you don’t have Olympus Pro lenses you can also have the chance to shoot with the stunning m.Zuiko Pro landscape lenses, the 12-40, 40-150, 7-14 and 8mm. Also discover first hand how you can use filters on the 7-14mm Pro with the Nisi Adapter I designed and produced. I will be running workshops to help you get the best from this Pro body to take the pain out the steep learning curve. Learn the unique features creatively, how to set it up to suit you, and how it can benefit you. If you are thinking of upgrading, try it out first on a Workshop. Workshops are full days and normally around 10 hours or longer if needed. Winter months with short days will restrict daylight shooting, although it's a chance to make the most of sunrise, sunset and low light. Summer months allow for shooting into late evenings. If you're not local but would still like a workshop with me I can travel within a reasonable distance, normally no more than 2 hours. Please note expenses for fuel will be required.